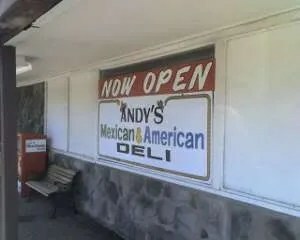 I had heard the rumors, but found out first hand that Andy’s Mexican & American Deli in Holt has reopened! J sent me on a food run this afternoon after hearing from a couple people that the deli was back in business. True to form, Andy recognized me when I walked in. He says he’s been open for about a month after taking some time off to attend to a family emergency. He’s working on getting the word out to his regular customers and hoping that through word of mouth people will start coming back. I’ve already done a review of Andy’s, but I do have to share a few things about today’s visit. Obviously, there was the fact that he remembered me when I walked in. It’s been several months since I had been in there. He knew my fiancee’s name and asked how she was doing. You don’t get that at many places. The food. J has been craving Andy’s quacamole for many months. We keep going to Mexican places and she keeps getting quac. She always complains about it not being nearly as good as Andy’s. Apparently avacado’s are expensive right now and Andy had to raise his prices. Most places would have just charged me and not said anything, but Andy told me before he made it that the price went up and if I still wanted it. J would pay a lot more for it, so I said yes. He remembered that J likes her quac with light onions. I also ordered five tacos for us to split. He asked if I wanted flour or corn. I asked if he had any hard shells. He said that wouldn’t be a problem and he actually fried up some tortillas so I could have hard shell tacos. Most places would have just said no. We’re both so happy Andy is back open. We’ll be making the short drive to Holt a little more regularly now. Totally agree – Andy’s is the best. I think I’ve been there half-dozen times since he’s reopened. My wife and I can’t get enough of his guac or the tacos. I think the chicken ones are better than the beef. When I talked to him this week, he mentioned he’s going to be adding even more items to the menu in the coming month. I’m curious to see what his plans are. Andy is my boyfriend and I agree with everyone how great his food is. Andy takes so much pride in his food and serving his customers. He is always excited to talk about his day at work and meeting new customers. He has so many ideas and plans to only make the Deli an even more better place to eatr. I love Andy with all my heart and am so glad and proud to see him doing so good and love to hear the nice things people have to say about his food. This place sounds great, but the posts are from 2 years ago and I’m wondering if he is still in business now in 2011. ??? I wish I could answer that question, but I live in Kalamazoo now and have no idea. I drive past where Andy’s used to be everyday. Last time I was there, he said he had plans to move to a location just south of the Jade Garden on Aurelius, but that was more than a year ago. There has been some movement in that building recently (looks like whatever it is will be opening soon), but I’m not sure if that’s Andy or someone else has bought the property. Another Mexican place has moved into the hardware store, but I haven’t had a chance to give it a try yet. If anyone knows where Andy went, I’d love to find out. His guacamole was the best.